Want to keep your skin clear and youthful? 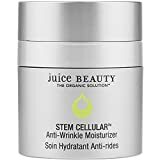 You will love Juice Beauty’s Stem Cellular Anti-wrinkle moisturizer. It is a rich antioxidant cream specially formulated to reduce the appearance of fine lines and wrinkles while keeping your skin hydrated. It combines vitamin c and fruit stem cells into a resveratrol-rich formula with antioxidant and anti-aging properties. These powerful ingredients help promote beautiful, youthful skin. Designed to nourish and protect your skin naturally, it is built from an antioxidant base derived from jojoba oil, linseed oil, and lemons. The cream also contains various natural moisturizing and soothing ingredients like Aloe Vera and sheer butter. Other nourishing organic ingredients include evening primrose, borage seed, apple juice and malic acid. The Stem Cellular moisturizer is Ideal for any skin type whether oily, dry or sensitive. It contains zero petroleum, parabens, pesticides, or artificial fragrances and dyes. It is a certified organic product that is safe for your skin and the environment. The Stem Cellular 12-in 1 Color Correcting cream evens your skin tone, provides sun protection and reduces fine lines and wrinkles. It gives your skin a youthful glow and nourishes it with a rich mix of various antioxidants. The cream is made from certified natural ingredients formulated for even the most sensitive of skins. Active ingredients include zinc oxide, aloe juice, apple juice, jojoba seed oil, organic coconut oil and lemon leaf cell among others. It contains zero artificial dyes and additives. The organic ingredients nourish and protect your skin from aging and color damage. They also actively protect your skin from UV damage with a high spectrum mineral SPF 30. 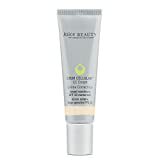 Juice beauty’s Stem Cellular cream is made for all skin types including dry, combined and sensitive. It comes in 5 shades; sun-kissed, deep glow, warm glow, natural glow and desert glow. So you can get the one that blends perfectly with your skin tone. 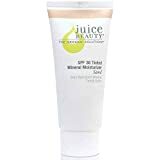 Juice beauty’s Tinted Mineral moisturizing cream is a must-have for your skin care kit. A rich blend of antioxidants keeps your skin young and glowing. SPF 30 protection keeps the damaging effects of UV well away. Made from a powerful formula of natural zinc oxide, apple, aloe and grape juices, the cream is great for sun proofing, soothing and hydrating the skin. It is formulated for all skin types whether sensitive, normal, dry or oily. Additionally, both young and mature skin will benefit from daily use of the cream. It’s also great for sun damaged skin, helping to get rid of fine lines, dull skin and sun spots. It is free of parabens, artificial dyes, artificial fragrances and other harmful ingredients. The cream is certified organic, cruelty-free and ecofriendly. It comes in four shades: sheer, ivory, sand and tan. So you can select the one that perfectly matches your skin tone. Regular deep cleaning does the skin a lot of good. That’s exactly what the BLEMISH CLEARING Cleanser does. It cleanses your skin to promote rejuvenation and eliminate unsightly blemishes such as whiteheads, acne scars and sun spots. Not only that, it also hydrates your skin using ingredients like aloe leaf juice and algae. It contains powerful cleansing ingredients including lemon balm leaf, dandelion leaf sage leaf and lemon. All these are fully organic, ensuring there is little risk of skin reaction. So you can go ahead and comfortably apply it on your skin, whatever type it is. It works especially well on combination and oily skin types that are prone to breakouts. This cleanser goes deep into your skin, eliminating the accumulated oils, dirt and dead skin that cause blemishes. Use it regularly and your skin will become smoother, more even and more vibrant. As with all Juice Beauty products, it is ecofriendly and was not tested on animals.